Some banners were modified, thanks to @Jkline3 (SUI and CZE). 2018 Olympics rom with full rosters. The base was made by slapshot, thank you. Kovalchuk and Datsyuk, obviously, are among the best players in the game. Hope you'll enjoy it. If somebody would be willing to do the base rom for previous Olympics (Nagano, Calgary??) in the future, I would do the rosters with pleasure. I used Corky & Slaphsot's Vancouver 2010 rom to create the 2018 World Juniors for my own personal enjoyment. Despite fooling around with Tile Molester for what seems like ages I just don't have the graphics knowledge/tutoring to put together a polished final product. Definitely interested to see what you come up with. I'm interested in working on an Olympic Rom. I've been watching the Olympic Hockey tournament and have found it very entertaining thus far. I watched South Korea vs the Czech Republic which turned out to be a very close and exciting game, and I just got done watching USA Slovakia, another thriller. Slovakia was called for a "too many men on the ice" penalty which led to the power play game winner for USA after an early warning to both teams earlier in the game for players leaving the bench too early on line changes, imagine that. USA rebounded from the Overtime loss to Slovenia, and played really well vs the much larger bodies of Slovakia. USA took advantage of the speed and stick handling advantage they had over Slovakia and did well to hold off a late Slovakia charge by continuing to attack in the 3rd period with the lead learning their lesson from their first match after sitting back and playing not to lose vs Slovenia and losing that game in Overtime. Olympic Athletes from Russia rebounded from the loss to Slovakia to beat Slovenia 8-2, setting up a crucial group stage game between Olympic Athletes from Russia and USA that could decide the group. Canada is off to a fast start with a big win over Switzerland, I look forward to seeing how they match up with Czech Republic and even South Korea who really took CR to the limit. It's interesting seeing the rosters with NHL Players not being allowed in this Olympics. Watching this tournament though really had me thinking about NHL94 and if we can put together a truly polished final product. My main question has to do with something I wondered about last year when I found out how to play with a real-time clock. As we know, the International / Olympic Standard Rink Size is much wider than NHL Rinks. (200 feet by 100 feet instead of 200 feet by 85 feet as it is in the NHL) Well as a result, watching Olympic Hockey makes NHL games feel like they are being played in a phone booth. The wider rink plus the differences between Olympic ice dimensions and the NHL dimensions, like longer neutral zones, shorter offensive zones (but wider), and more room to work with behind the net (13 feet compared to 11 feet) creates more open ice and free flowing skating. After watching some of this Olympic Hockey Tournament, I wanted to know if it's possible to mod the rinks in NHL 94 to make the playing surface wider and bigger overall. In NHL 94, I always felt that the player-to-rink size ratio does not match NHL standards (players are just too big for the size of the NHL94 rink). If it were possible to actually mod the size of the rink dimensions to be wider and / or longer, I think it will greatly enhance the gameplay of NHL 94. Just imagine being able to skate in a bigger rink in NHL 94, you can't deny it's a fun idea. In the spirit of Olympic Hockey, I'd like to work with anyone interested in creating an Olympic size rink in NHL 94, with a true-to-life player size to rink size ratio with more open space to match the kind of formations and free flowing skating we see in Olympic hockey. I'd imagine that moving the blue lines (editing the size of the neutral zone) is possible from an artwork perspective, but any change to that would need to be accompanied by the actual blue line location, the location on the ice that the game actually recognizes offsides being called. Increasing the length of the neutral zone and the whole NHL 94 rink I think would make it easier to play the game with offsides on, because with such a big player size to rink size ratio in NHL 94 (even vs NHL rink standards) you don't have much space to maneuver in that neutral zone and even less vs an actual Olympic hockey game. Given the difficulties involved in making the NHL 94 rink longer, I'd imagine that making the ice surface wider would be easier than making it longer because you won't have to worry about the location of the blue line / goal line. So presumably seeing if we can make the NHL 94 rink wider would seem to be the first step and the biggest hurdle in trying to bring NHL 94 to Olympic / International Standards. Now I don't for a minute think that making the NHL 94 rink bigger or wider is gonna be easy, it might require a lot of research and possibly making edits to the artwork (moving back the boards, crowd, benches, etc in the arena) and we don't know how the camera would react to a larger rink, but somewhere in the hex there's got to be an address that contains information related to the size of the playable space of the rink / ice surface. If someone wants to work on the Olympic Rosters, logos, etc that'd be great, but to make it a true polished final product, there's no way to do that without making the actual rink / ice surface bigger. (wider and longer if possible) As it stands, as great as NHL 94 is, as much as we all love the Genesis version and this hockey engine, the fact is that the player size to rink size ratio in NHL 94 just doesn't match NHL rinks let alone Olympic standards. 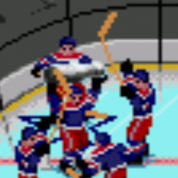 There's got to be a way to make this mod a reality and allow us to experience NHL 94 on a bigger / wider Olympic size ice surface. 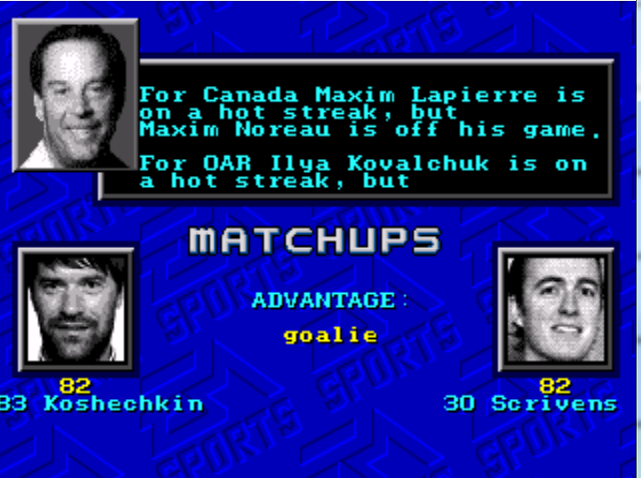 I'm willing to dedicate time and effort to research how to do this, but I think I'm going to need the help and expertise of the finest NHL 94 modders on here as I'm just not as experienced with NHL 94 as some of the experts are. I do have some practical skill in finding hard-to-find codes / hex addresses, but I really don't know where to start when it comes to finding the actual ice dimensions. 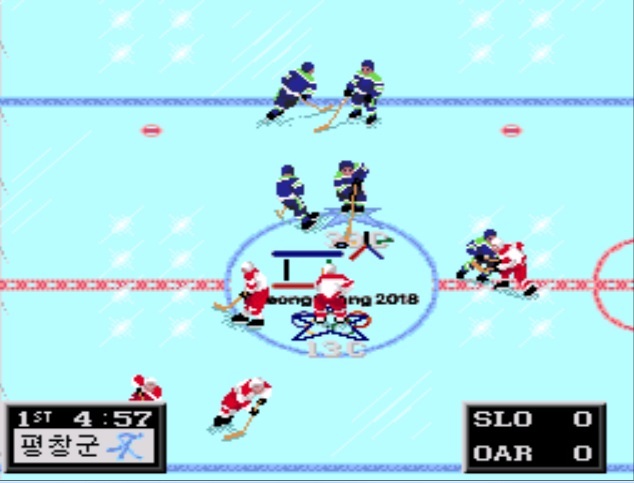 If anyone is willing to help me figure out how to make NHL 94 up to Olympic rink standards, I'd be up for the challenge as we watch the Olympic Hockey Tournament unfold. here is the official Pyeongchang 2018 rom , it has both men's and women's teams, just needs the rosters filled. Out of curiosity, how long did it take to create the shell ROM? Well... I did not expect to get so much disrespect after starting this thread, especially from "Brodeur". I noticed that you buddy could be a greater hockey reporter than I am actually. My goal was only to say that I would fill the rosters with pleasure IF anybody would help with the graphical part, for what, I must admit, I am not capable. If it takes too much time or if nobody is interested, let it be, tell it in a short and polite way, and that's it! If you thought that my goal is only to profit from the work of the greatest guys here whom I've so much respect for (smozoma, kingraph, slapshot, CoachMac, Naples, skip, etc etc), you're wrong. I don't know which contributions you brought here, dear Brodeur, and for sure they are many more than mine. But, below, you'll find my poor "finished products". I made "IIHF 94" with slapshot's help, "LNA 94-95" with Coach Mac's help, and "NHL 1990", starting from slapshot's 1989. Thanks a lot again to all these great guys who are making our dreams come true. I made them because I did not only want to download roms, but also bring my little contribution, doing rosters for original roms. I think that we are all adults here, and that we all deserve respect, it is not? After all, we are all sharing this common passion for NHL 94. Please note that english is not my mother tongue, I've never learnt it, actually. But I think I am smart enough to detect irony. This said, best regards, have a nice evening. And greetings from Europe. mitch13, I have the upmost respect for you and all the guys on here who have done such great work. My goal is only to seek assistance on what other editing can be done with NHL 94, in this case determining if it is possible to increase the size of the ice / rink in NHL 94 for an olympic rom. It seemed appropriate given the topic of an Olympic rom and your desire to find anybody to "collaborate" with you. My intention was only to support an olympic rom by asking about what is possible in editing. Apologies if I was too long winded, I did not mean to take anything away from your topic. I'd be happy to collaborate with you on the Olympic rom in any way I can, but I'm afraid I am relatively new to the community and am still learning how to use some of the editing tools. @slapshot67, I've started to edit the rom you gave us. So you want to get the women's team as well into the rom? No problem for me, I'll edit them also. Thank you very much for your so much appreciated work!!!! I'll be as quick as possible, but I won't be done before a couple of weeks. Did u upload the World Juniors rom or rather have there been World Junior ROMs on this site??? Dear @slapshot67, would it be possible to get a PyeongChang version without the women's teams? I mean it's difficult to evaluate the ratings of the female players. But, again, I don't know if it's possible regarding the playoff trees and how much time you would need to do that. If it takes too much time, forget it. I keep working on the male rosters. 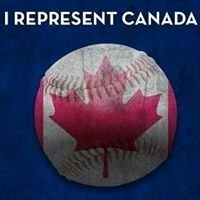 "My" rom is a blatant ripoff of the Vancouver 2010 rom with just the rosters of the 22 countries participating in the WJC and Division I updated and rated, still has Vancouver logos, splash screens, etc. Definitely not comfortable uploading it. I'm late to NHL94 modding so I have been using that as a training ground as I catch up on so many others' great work and research, but unfortunately I seem to have hit the wall when it comes to the graphics side. I did this in about 10 minutes using EARE. Super Easy Program just like NOSE that does some things NOSE does not. Smozoma deserves the credit and that is one of many reasons he gets one of my custom Bobbleheads. Updated the playoff tree too. PS Great Job on the rom Slapshot. It looks nice! Sorry Coach, next time I'll try to cut teams by myself with EARE. Thank you! I input the women's teams for kicks. Not easy with such a limited sample size and trying to bridge the difference between US/Canada and Korea... Fire away. Rom with full rosters available in the first post of this thread. Thanks again Mitch. Looking forward to giving them a shot. Hey Mitch, awesome stuff! I cannot wait to check this out. I started doing just the goalies last weekend and it was taking me forever, so I put it on hold. One thing that Lupz27 pointed out to me on my previous ROM edits - he said he found the goalies to be wonky when I made the Off Awr and Def Awr different. I never really noticed, but the original NHL'94 goalies all had the same Off Awr as Def Awr, so I figured he was right. Not sure if it matters, but wanted to let you know! GREAT WORK man, thanks so much for all the time you put in! 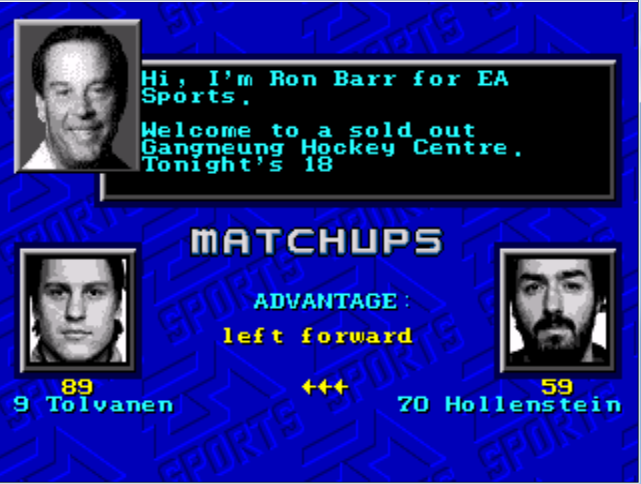 Making Olympic ROMs with the NHL players was far quicker to "plug and play" aside from a few teams. New version with player cards for all starters in the first post of this thread. Yup, this Calgary 88 rom was made by Jkline3 and myself. Awesome work. I use it and that Russian team is brutal to defeat.